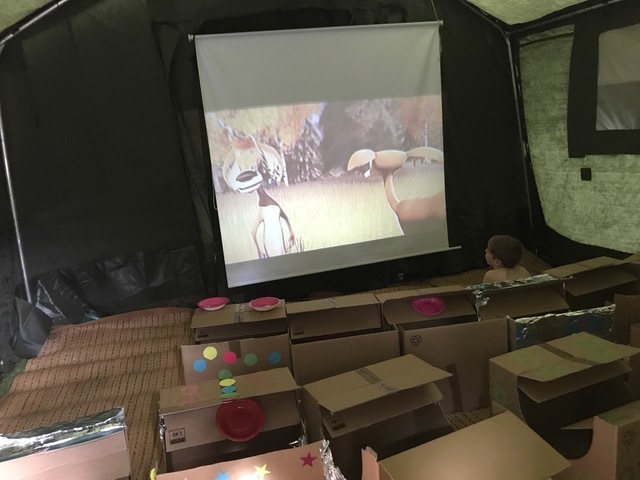 During a recent Corporate Day this outdoor event included creating a Children’s space where people could make cardboard cars for the drive in movie tent that screened the movie ‘Herbie rides again’. The children definitely enjoyed being creative and had a sense of achievement from their finished creations. This outdoor activity on our Pop Up campsite is one of many. We also offer field attractions, family friendly activities and team building exercises for corporate events. One of our most popular things to do especially for families and all ages is learning Bushcraft with Steve of Axe and Paddle Bushcraft. In addition to the Bushcraft experience there are extras available such as a Billy Can Breakfast and wood fired pizzas. 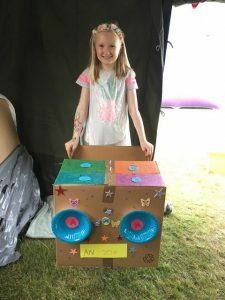 Pictured above is one of the many brilliant cardboard car creations made for fun in the outdoor children’s space and used as part of the drive in movie experience on site. Two more theatrical sequels followed Herbie Rides Again namely Herbie Goes to Monte Carlo and Herbie Goes Bananas and a later in 2005, Herbie: Fully Loaded was released. The trailer for the 1975 British comedy films Monty Python and the Holy Grail reference the title.